This salad makes a really nice lunch and may be prepared in advance. It does take a long time to cook beets though, even in the pressure cooker, so I would advise selecting small beets of even size rather than larger ones. Now, when you buy beets in France at the store or at the market, they are already cooked; how civilized! Here in Canada, we have to boil them whole first. So do boil the potatoes and the beets separately until done but still firm. 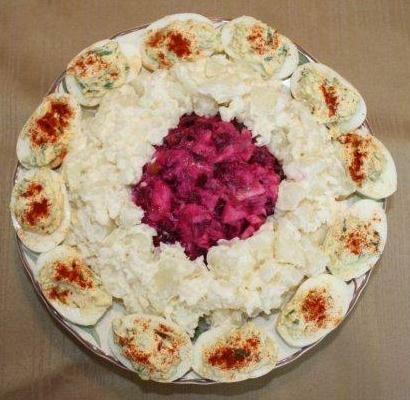 For the salad, we need an equal number of beets and potatoes, (Yukon gold or New potatoes) . Once they are cooked, do a quick splash under cold water and peel them. Slice both the beets and the potatoes. Arrange on a serving bowl, and pour the dressing on top, then sprinkle with parsley and chives. Dressing: 1 tsp Dijon mustard, 3 tbsp oil, 1 tbsp red wine vinegar, 1/4 cup white wine, 1 tbsp lemon juice, one or two cloves garlic crushed, 2 green onions sliced, 3 unsweetened pickles sliced, 1 small can flaked tuna, salt and pepper. This salad contains all food groups and makes an easy nutritious and refreshing lunch for a hot day. This is served on my grand-mother Marie-Louise’s Limoges white china with a silver trim from the twenties. Make sure to keep the greens from the beets, they make a tasty vegetables too. This entry was posted in Lunch, Starter and tagged beet salad, beets, cooking, food, french, lunch, nutritious, recipe, recipes, tuna. Bookmark the permalink. I think this is where the “Automatically generated” came in. It looked so good I wanted to make it.